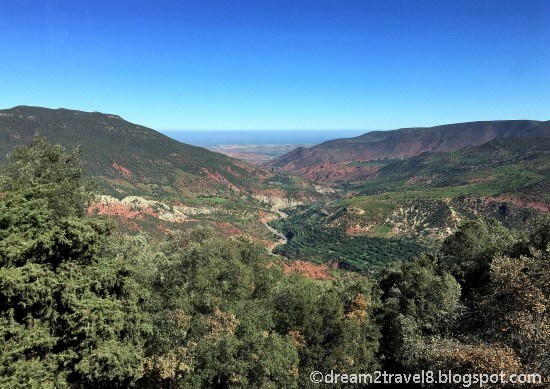 It was going to be another day spent mainly on the roads as we ventured from Merzouga to Fez, with stops at the top of the Ziz valley, Kasbah Asmaa hotel and Ifrane along the way. After a hearty breakfast, we hopped onto our van and set off on the road. Blessed with good weather and surrounded by the boundless and gorgeous landscapes along the way, it was no wonder that everyone was in good spirits. What a great start to the day! 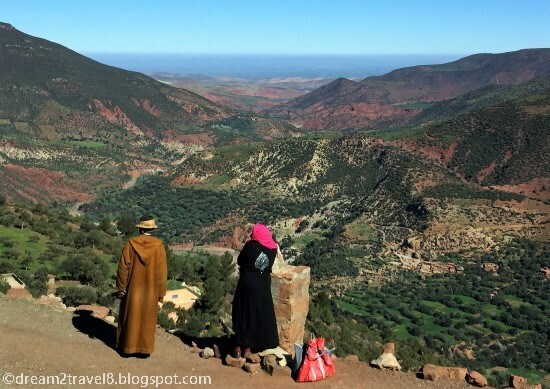 After a few hours on the road, losing ourselves in the ever-changing landscapes of Morocco, we arrived at a photo-point overlooking the Ziz valley. The area was big and spacious, which provided ample space for us to stretch our stiffened joints from the long journey. 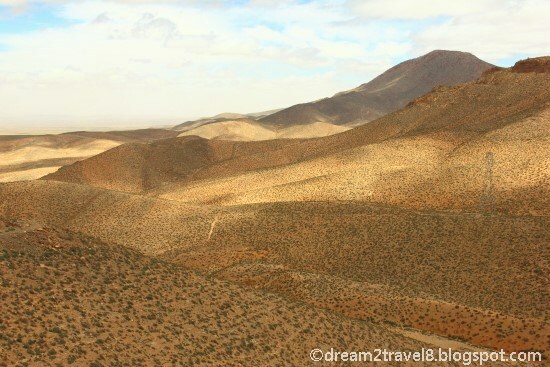 As we ventured further towards the edge of the cliff, we were rewarded with a panoramic view of the Ziz valley. It comprised of a whole stretch of fertile land filled with countless trees and rock formation, a stark contrast to the barren land surrounding it! It was a gorgeous sight and as we were the only group there, we could totally enjoy this marvelous place to our hearts’ contents! There was even a made-shift stall where the locals were selling their harvested red dates. Our guide, who had been ever so enthusiastic about introducing the Moroccan food and culture, purchased a box of red dates and let us try it on the van. It was sweet and fleshy and certainly made a good snack! ..which spanned across a large area.. 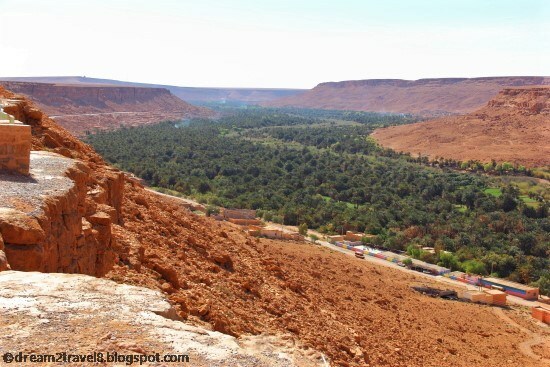 Satisfied with such a breathtaking view, we continued on our journey and it was another good few hours drive before we arrived at our lunch destination - Kasbah Asmaa hotel. The hotel looked like a small castle built in the middle of nowhere. Its exterior appearance was impressive enough to make one take a second look. However, by this time, our luck with good weather seemed to be used up as the sky started to be covered with dark clouds. 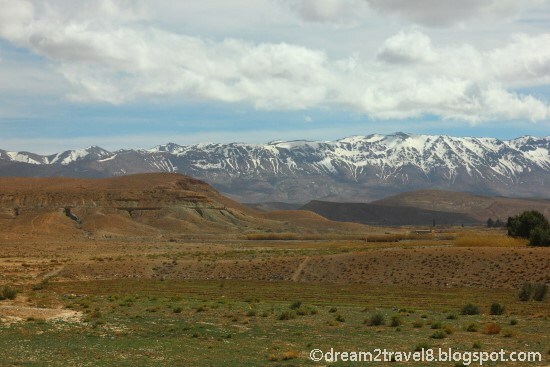 As soon as we alighted from the van, the strong gushes of wind started to throw all of us into panic mode as we desperately tried to make a dash for the hotel entrance and away from the relentless wind! This sudden change in weather has certainly dashed all my hope of being able to take a good photo of the exterior appearance of this beautiful hotel without being blown off by the wind! Look at how the trees were bending under the strong winds..
Back in the warm interior of the hotel, we were ushered to a nice corner to have our lunch. 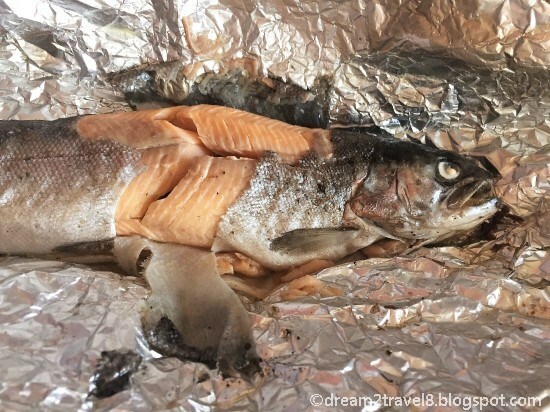 My husband and I decided to be more adventurous with our food choices and opted to have the Moroccan brochette (or kebab) as well as the hotel’s speciality - fresh trout. The food was awesome! 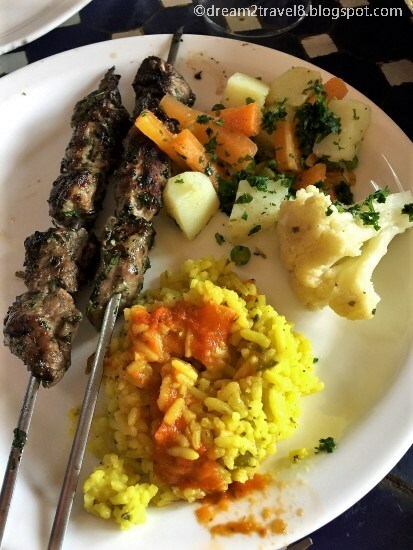 The brochette meat was tender and juicy and the trout was fresh and tasty - the perfect comfort food for this cold and windy day! 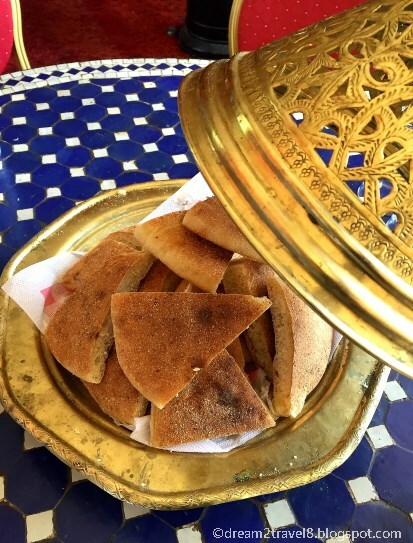 Yummy bread that comes with our main course..
With tummies filled, we headed off to our next destination - Ifrane. 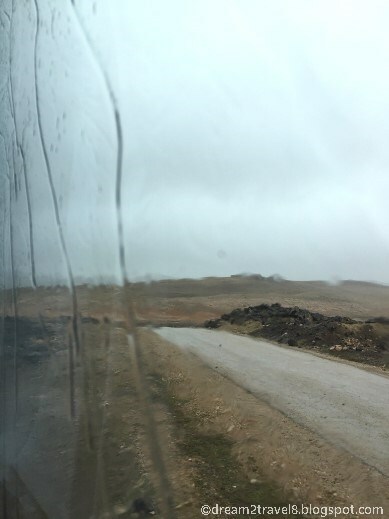 This next stretch of our drive proved to be very challenging for our driver as he had to navigate slowly through the roads with poor visibility brought on by the heavy rain. The heavy lunch paired with a nice and rainy weather soon started to make my eyelids feel heavier and before I know it, I had dozed off into a sweet afternoon nap! By the time I woke up, we were already approaching the entrance to Ifrane. Upon entering Ifrane, we noticed some soldiers standing guard outside a particular enclosed area to which our guide explained that that is actually the royal palace. The next thing that caught my attention was how much this small town resembles an European town, with its European-styled architectures and floral species. 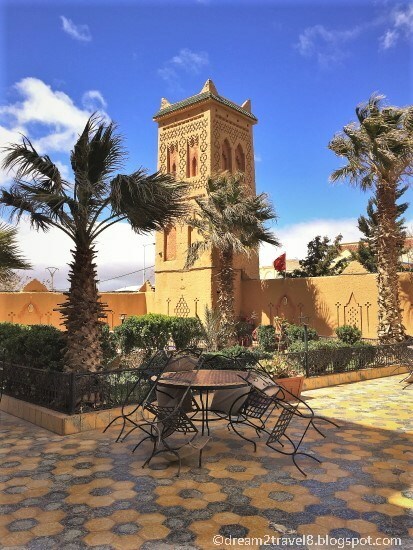 The place was very quiet, clean and neat and was totally different from the other major bustling Moroccan towns like Casablanca or Marrakesh that we had visited! This current modern town was established by the French administration in 1929, which explains for this striking difference in the layout and outlook of the town. 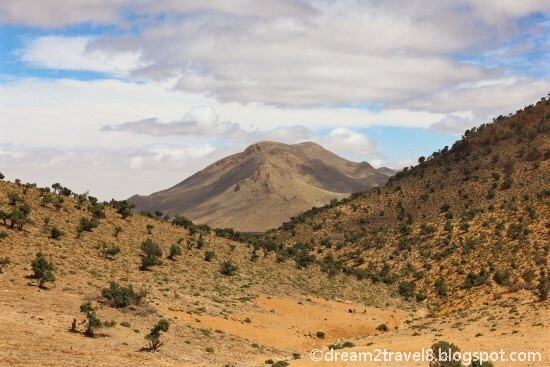 According to our guide, Ifrane generally has a cooler climate as it is located at an elevated point, which thus also made it a popular location for people trying to seek relief from the hot summer heat. 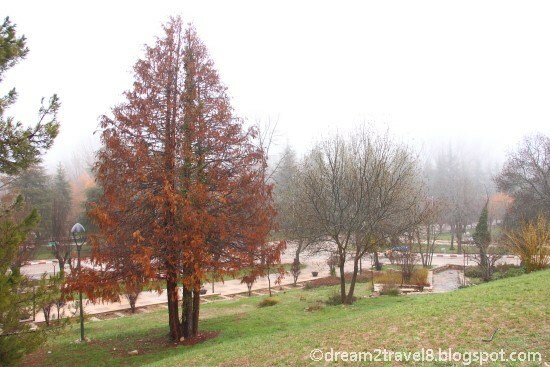 Although much has been said of its beauty, it was a pity that we did not get to witness that side of Ifrane. The charm of this town was dampened by the wet and cold weather and we ended up taking a short rest at a cafe as the heavy rain made it almost impossible to explore the town. Perhaps, we would see it in a different light in a better weather condition! When the rain became lighter, we decided to continue on with the journey to Fes for dinner and to turn in for the night. 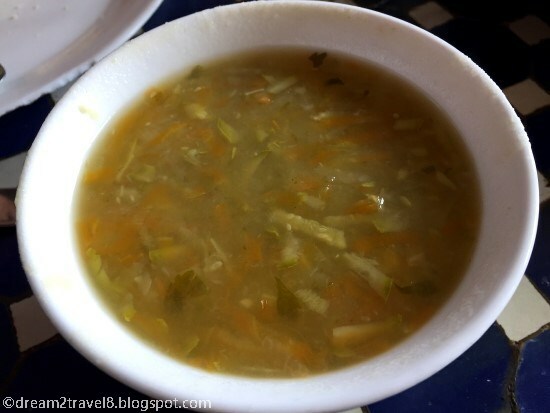 The food is indeed amazing and different from what I am used to - but certainly worth a try! Gosh the views of this region are spectacular and looks like not at all crowded. 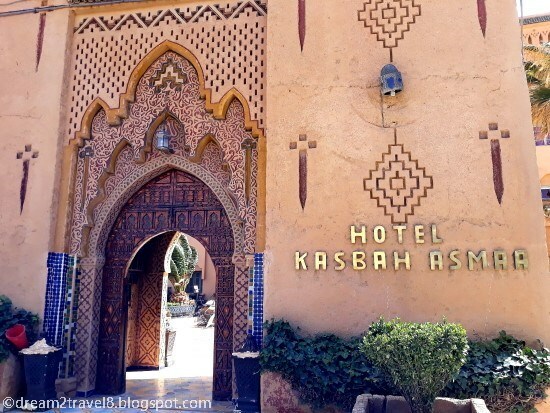 Love the loko of Kasbah Asmaa, such an oasis of luxury and beauty. 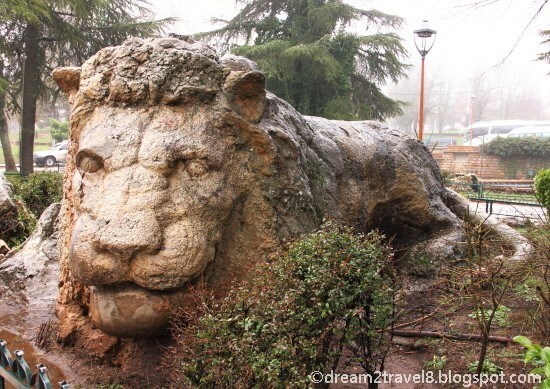 Ifrane also looks well worth visiting, the lion statue is charming. 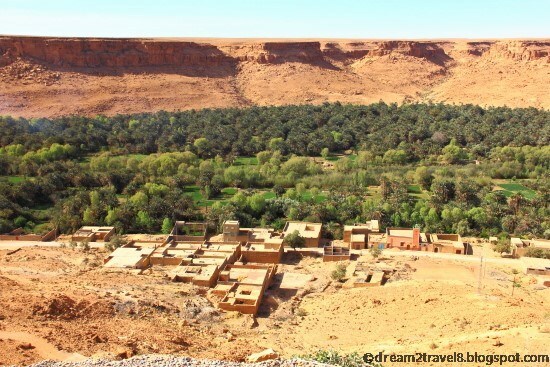 We also recently got back from a trip around Morocco, and definitely agree with you. The Moroccan countryside is so gorgeous and such a delight to drive through, even in the wet weather! We didn't get to try any dates but they sound delicious. I'm already looking forward to my next trip! I love your pictures. 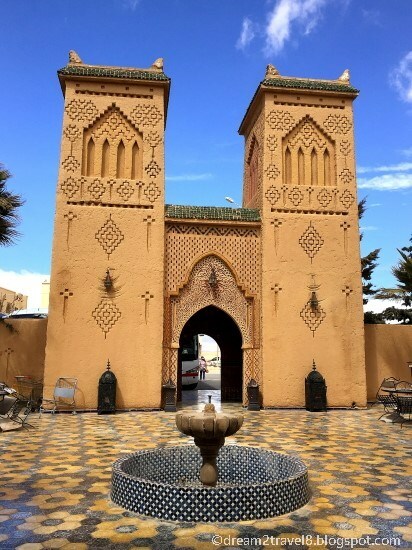 Morocco is a fascinating place and your post captures it's beauty perfectly. Trying the local cuisine is definitely on my buckelist. 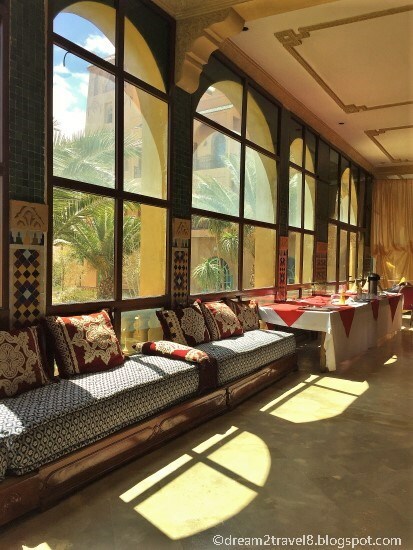 Kasbah Asmaa hotel looks so exquisite. Indeed it has all the characteristics of a castle. Looks so artistic.The food seems to match its ambience too. Ifrane looks spectacular too. I was riveted by the image of the statue of the lion which looks so magnificent. The landscapes are quite varied here. One hand you have the snow peaks and the sandy barren land in front of that. Love that diversity. Love the colorful interiors of the hotel that you stayed it. The typical Moroccon decor has always appealed to me. Hi Ami, thanks for dropping by :) Yes, I was quite amazed by how the landscape changed as we traveled from one region to the other - it certainly did felt like we have traveled to several different countries in a day! Glad that you enjoyed this post and the photos!